ThinkFree Office 3.0 is a Java-based application that provides much of the power of Microsoft Office at a much lower price. The program is aimed at users looking for an inexpensive, basic word processor and spreadsheet application, as well as those who have to edit documents created with Microsoft’s Office suite. ThinkFree Office consists of three parts: Write for word processing, Calc for spreadsheets, and Show for presentations. However, the programs do not constitute a suite in the same manner as Office 2004: with ThinkFree Office, the separate programs are not interoperable, so you cannot cut and paste or drag and drop elements between applications. The latest version isn’t really a substantial upgrade from the previous incarnation, but it’s still a solid program if you don’t need the high-end features of Microsoft Office. If you’ve used Java-based programs in the past, you know that they tend to be slow. But that’s nothing to worry about here. As we noted in our review of ThinkFree Office 2.0 ( ), this application is no tortoise when it comes to speed. Write, Calc, and Show load quickly and work about as fast as any non-Java application. Still, it’s wise to make sure you have the latest Java update installed to ensure optimal performance. As a general-purpose word processor, Write does an excellent job. It plays well with Word files and provides almost all of the tools you need to create documents. This includes support for embedded images, text boxes, footnotes, and outlines. There are a few negatives, though. At present, Write does a poor job of importing styles from Microsoft Word ( ) templates and lacks the ability to track changes made during editing; ThinkFree says that these features should be available in a future release. ThinkFree Show had difficulty handling basic PowerPoint files: observe the way it renders the drop shadows. In addition, Write currently does not support certain common keyboard combinations, such as Option-Shift-Dash (which forms an em-dash). Also, you can’t drag and drop selected text from one part of a document to another. ThinkFree says that it will address these issues in a future release. Calc is the standout application of the ThinkFree troika. I was able to open and manipulate several different types of Microsoft Excel ( ) documents without a hitch. Plus, the program easily handles hundreds of calculation formulas, from simple math to complicated amortization tables. The previous version of Calc was unable to deal with 3-D graphs—that’s no longer an issue. ThinkFree Office now lets you create 3-D graphs as well as open those generated in Excel. It also features support for transparent graphics. In fact, the only remaining weakness in Calc is performance. It’s not horribly slow, however I did notice a brief but perceptible pause when updating calculations and tabbing through cells. 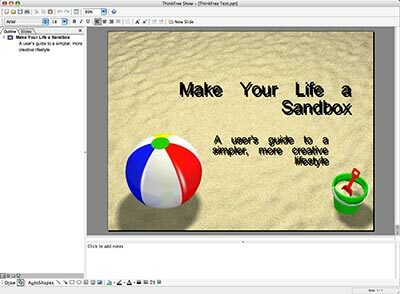 ThinkFree’s presentation application remains the weak link in the package. As with the previous version, Show continues to do a poor job of handling drop shadows and some embedded graphics. For example, when I opened files created in Microsoft PowerPoint ( ), drop-shadowed text did not render correctly. Furthermore, when opening PowerPoint files, the program sometimes did not display fonts correctly, and often spaced characters improperly. ThinkFree says it plans to fix these issues. At this point, though, you’ll only be satisfied with Show if you’re editing or creating basic presentations. For anything better, you’ll want to use PowerPoint or Apple Keynote ( ). ThinkFree is preparing to offer one more interesting option: the ability to access all of these apps over the Internet. (The Java applet loads from a Web page on ThinkFree’s site, allowing you to use the applications from a browser. Thus, any operation you can now perform on your desktop can be done in the browser window.) ThinkFree Online is still in beta at this writing, and the company has not given a release date. ThinkFree Office 3.0 is not a massive upgrade from the previous version. And it’s not the perfect solution for everyone, especially if you want to create presentations or you regularly use Word’s styles or Track Changes features. However, if you have to create and edit Word and Excel documents—but you don’t need all of the high-end features available in those programs—ThinkFree Office offers a viable and inexpensive alternative.